Watching in fascination as Hubert the Hamster tucks enough sunflower seeds into his cheek pouches to feed himself for at least a week, you may reflect on the nature of this tiny creature. Wild or untamed hamsters' harvesting-and-hoarding subsistence makes them enemies of farmers as their habitat and range decline in the face of human progress worldwide. 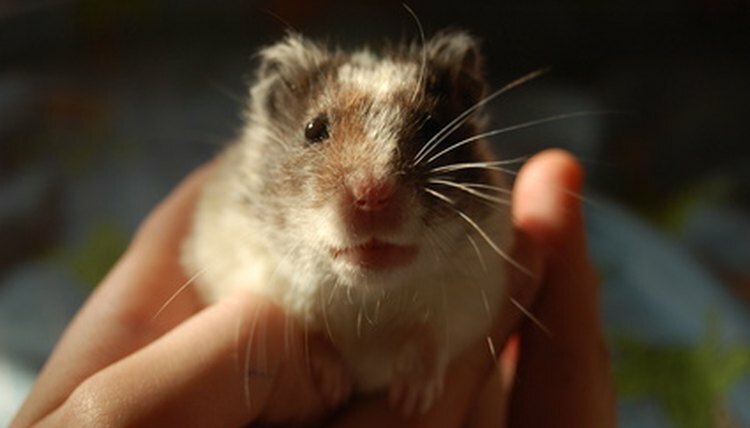 The rarest species of wild hamsters thrive only as pets in homes across the United States and Europe. The golden hamster or Syrian hamster (Mesocricetus auratus), also called the teddy bear, is a popular pet in homes in the United States and Europe. All domesticated golden hamsters are descended from three hamsters captured in 1930 in Syria by Professor Israel Aharoni, a biologist working in Jerusalem. While common in captivity, in the wild the golden hamster is listed as vulnerable by the International Union for Conservation of Nature and Natural Resources. The wild golden hamster is found only in a small region of northwest Syria. Romanian hamsters (Mesocricetus newtoni) are listed as near-threatened by IUCN, in part because of the limited habitat available to these charming rodents. In 1995, the entire Romanian hamster population living next to the Danube River in Bulgaria and Romania was estimated at only 3,000 adults. Since then many abandoned fields have been reclaimed and are intensively farmed, further limiting the available habitat. According to the IUCN, the wild Romanian hamster population is declining. Another species of hamster, the Brandt's hamster (Mesocricetus brandti) is declining in its native habitat, the steppes and mountain grasslands of southeastern Europe and the northern Middle East. While becoming rare in agricultural regions, the hamster carries on in protected areas of the steppes. The IUCN lists the Brandt's hamster as near-threatened. The European hamster (Cricetus cricetus), also known as the black-bellied hamster and other names, is still plentiful in most of its range. However, some subspecies, such as the French black-bellied hamster, have been decimated by farming and urban development. Only about 800 French hamsters remain in the wild, and conservationists would like the population to double to ensure the subspecies survives.